Brazil is best known for the Amazon region in terms of ecotourism and nature. The two parks in that area that offer the most hiking trails are the Pico da Neblina and Jaú National Parks. Some of the best snorkeling around is near Bonito in the rivers that abound there. There is a high concentration of limestone leaving the waters some of the clearest in the world. This also means there is a lot of diverse fish and tropical vegetation around. 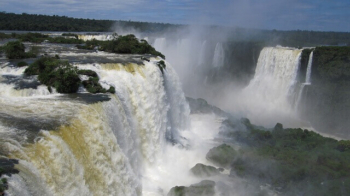 Below is an image of Iguazu Falls, which is another attraction. Right now we don’t have any Brazil Eco Lodges-Tours but we are actively looking so please check back.